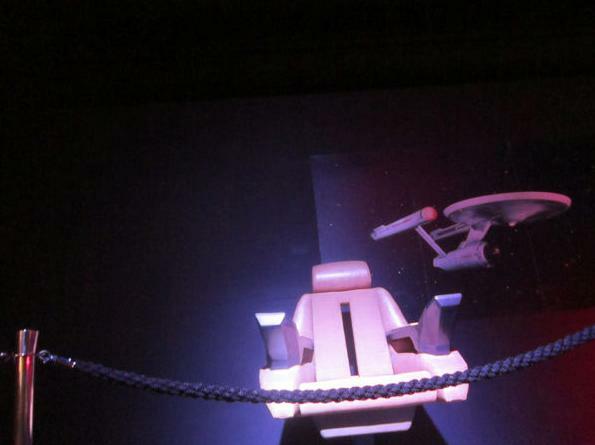 2014 Road Trip Photos #10: The Enterprise Incident « Midlife Crisis Crossover! We spent actual dollars having this souvenir photo taken just so we’d have visual evidence to share with friends. Unfortunately my color-correction skills aren’t up to the task of overriding the exhibit camera’s “Radioactive Circus” filter. Captain’s Log, stardate 2114.198, Day Three of our trip. Our time frame, destination, and course were all charted months before our missions were chosen. During the itinerary process we discovered one optional assignment that was not indigenous to our target area, but had been established in the Twin Cities area a mere two months before our arrival. While surveying the metropolitan areas themselves was our primary objective, my First Officer and I agreed this might be the sole opportunity of our lifetime to take advantage — not only as a recreational side quest for the sake of our crew (both of us), but as a fact-finding investigation for our colleagues back at HQ. 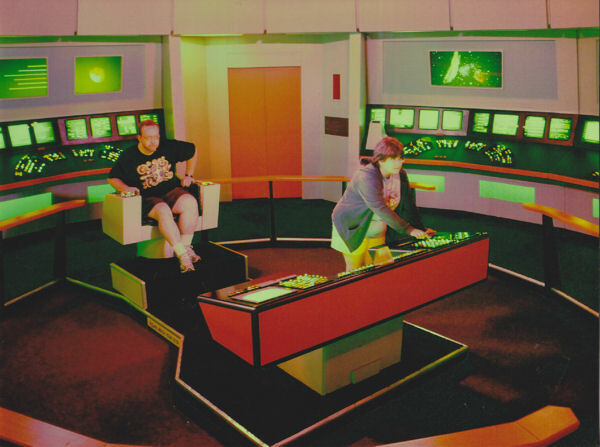 So that’s why we returned to the Mall of America: not because we love shopping (meh), but because we figured such excellent timing obligated us to check out the traveling museum tour known as Star Trek: the Exhibition. Curiously, copies of this poster were not for sale, but they had plenty of T-shirts in other people’s sizes. We arrived half an hour before the Exhibition and all the other MoA stored opened, because conventions taught us the value of being at the front of geek lines as opposed to being stuck several hundred deep. On this Monday morning, crowds weren’t a problem. At all. Eight or ten other people were waiting with us outside the EMS Exhibit Center until the glass front doors were unlocked, but we were the only ones there for Trek purposes. Bad news about that: signs posted everywhere prohibited photography inside the Exhibition. Photos outside the Exhibition were no big deal. I can show you this prop from the other major attraction, Barbie: the Dreamhouse Experience, because it was in the commons area outside both exhibit halls. 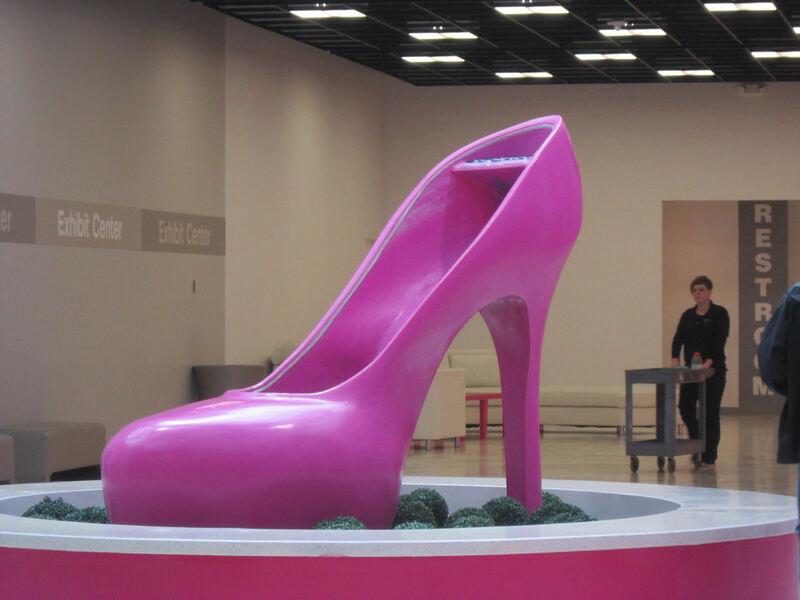 And when you’re done gazing upon MegaBarbie’s Dream Louboutin, be sure to pick up doll-size and life-size replicas at any one of our four Mall of America toy shops or 600 shoe stores! 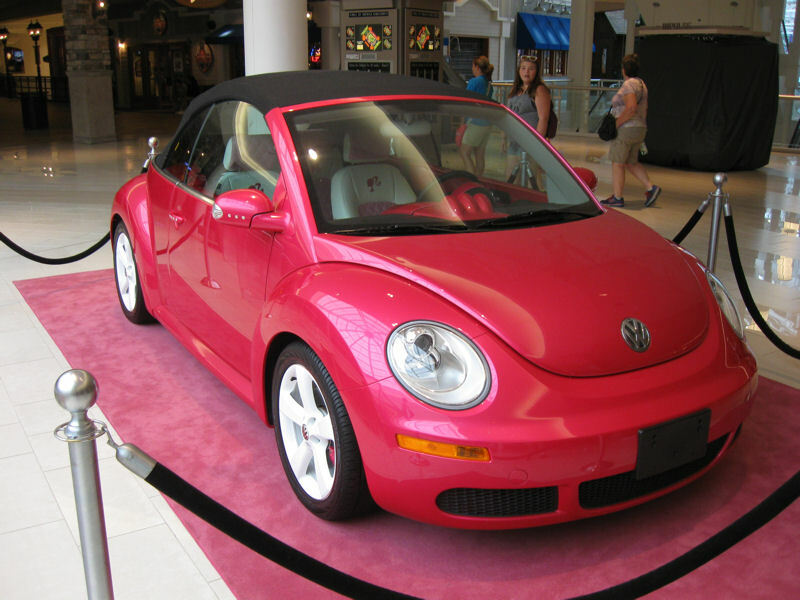 Beyond the Exhibit Center itself, you could also peer into this promotional Barbie-themed VW, directing shoppers to immerse themselves in the Barbie Experience and thrill to a whole new world of happy dolly goodness. Take selfies near it, even. Suburban Barbie’s Modesty Scaled-Back Dream Car includes all-pink interior, vanity plates, fuzzy stuffed animals, and a working engine that Ken wouldn’t dare touch for fear of getting grease on his ascot. 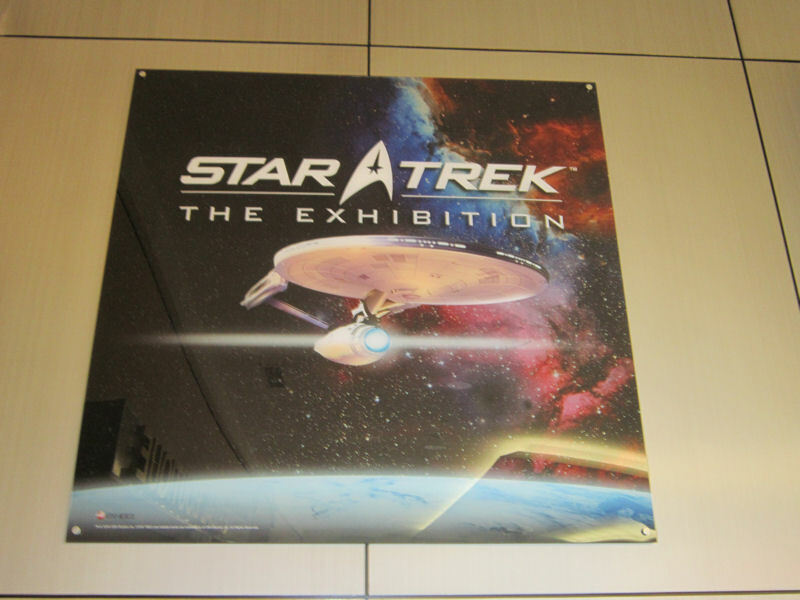 The Trek Exhibition’s exterior props included the above poster and an underwhelming gift shop of remaindered clothing and toys that stopped flying off store shelves long, long ago. No, we didn’t take photos of any of that. However, as far as I know, text recollections won’t violate the Mall Directive. The Exhibition centerpiece is the replica bridge shown above. They’ll take a photo of your party at the helm with their wall-mounted camera for a price, and what you see was the best of their two tries. No, there’s no battle simulation or any real action involved. You have your choice of sitting in the Captain’s Chair or manning the comm without sitting, just like a true nervous ensign trying to make the most of their five-second screen presence. The first showpiece as you enter the Exhibition is an extra-long wall-sized timeline of nearly the entire the Trek universe as we knew it before JJ Abrams took a baseball bat to everything. It skips the animated series but otherwise charts everything from the Original Series to (ugh) Enterprise, from ancient alien times to the Enterprise-E’s post-Nemesis repairs, including the key historical events and the minor details, such as when Kirk’s dog Butler died and when Sulu’s daughter Demora was born. As you’re walking along and scrutinizing the timeline, you can listen to Trek theme songs piped in from above, the classically heroic instrumentals back-to-back with (sigh) “Faith of the Heart”. * Costumes worn by three of the starring captains, including four different Kirk suits (but, to my consternation, zero for Avery Brooks); Marina Sirtis; Brent Spiner; Whoopi Goldberg; Ricardo Montalban, the second time around; James Cromwell; Wallace Shawn; Dallas‘ Susan Howard (Kang’s wife Mara in “Day of the Dove”); some Kazon extra (looking a bit clown-like in person); someone from “Spock’s Brain”; and future A-list movie star Tom Hardy, whose career trajectory has taken him from Star Trek: Nemesis to next summer’s Mad Max: Fury Road. This may or may not be a seat of any real significance. Photo possibly taken by some anonymous punk kid who should totally be tracked down and shamed. Darn those anonymous punk kids. …or we could just leave it alone and trust that you get the idea.